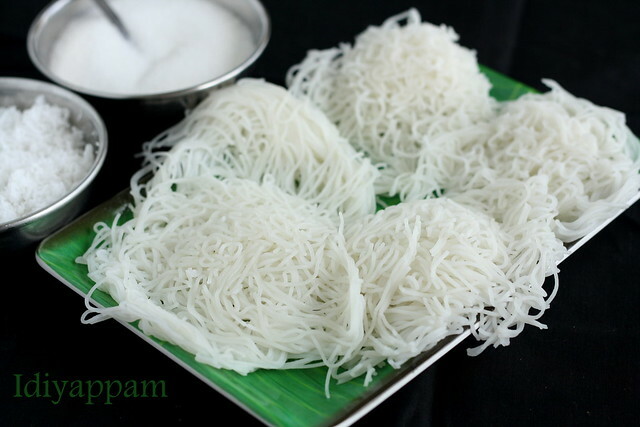 Idiyappam | Sevai | string hoppers is a very rare dish we make it at home. 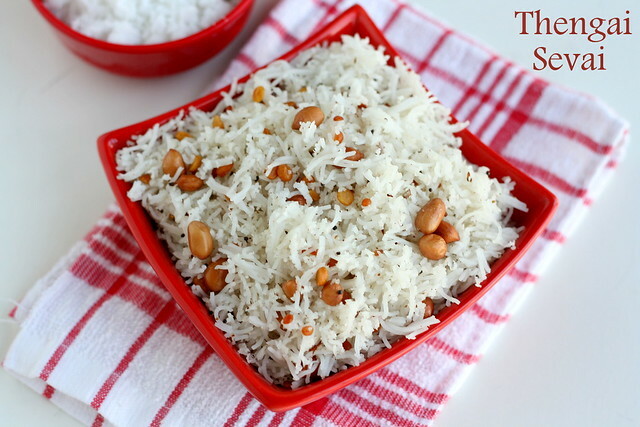 My mom makes it regularly using the traditional Sevai Nazhi , which is very tough( i feel) but we used to help her when we were kids. She makes variety of Sevai and i will soon post the recipes of the sevai soon. My kids don’t prefer much and only me and my hubby only eat this and whenever i make this i do for dinner only.So never had chance to click. Somehow last week i managed to make this for breakfast and clicked too. 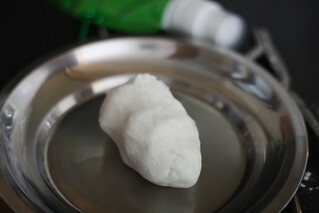 This is very handy if you don’t have Idli | dosa batter at home. 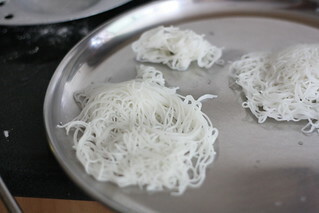 I used the idiyappam flour but you can use plain rice flour too. In a pan add water and add salt and oil to it. Keep the flour in a wide bowl. When you see small bubbles of water switch off the flame and add it slowly to the flour. when it is warm mix it nicely with a spoon and with you hands make it into equal portions to fit into the press. Use the omapodi achhu for this. Grease an idli plate and press medium sized circles . Steam this for 5 minutes. After a minute take it out from the idli plate and transfer it a wide plate and cover it with a damp cloth to keep it moist and to avoid drying. Repeat the process for the rest of the dough. If you are going to have it with coconut and sugar just add the sugar to the mix and start mixing it gently. Add coconut in the last and mix well. If you like coconut milk you can serve it with coconut milk too. 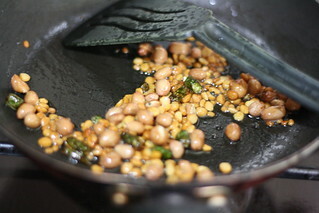 In a pan add oil and add mustard seeds, channa dal,urad dal, chopped green chilli, peanuts and saute in a medium flame till the dal and peanuts become golden brown. 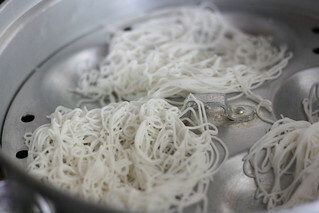 Add this to the plain idiyappam and add a tsp of coconut oil. In the same pan saute the coconut in a low flame till it gives a nice aroma. 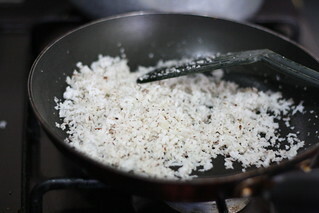 Add this also to the plain idiyappam and mix it gently with clean dry hands. You can have Idiyappam with Vegetable Stew. 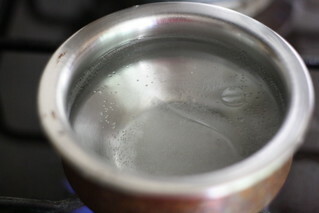 While boiling the water to make idiyappam do not boil too much. Do not steam the idiyappams for too long. Else it will become rubbery. jeyashri does your idly pan have hole in the centers? because my idly pan does not have , i feel thats the reason i am not getting the idiyappam properly? If using idli plates with holes, use a clean muslin cloth ( spread the cloth on the pan ) and make idiyappams on that. one of my faves. can eat it any time of the day or night. it's so light on the stomach. love these sevai!!! so healthy and so yummy!!! 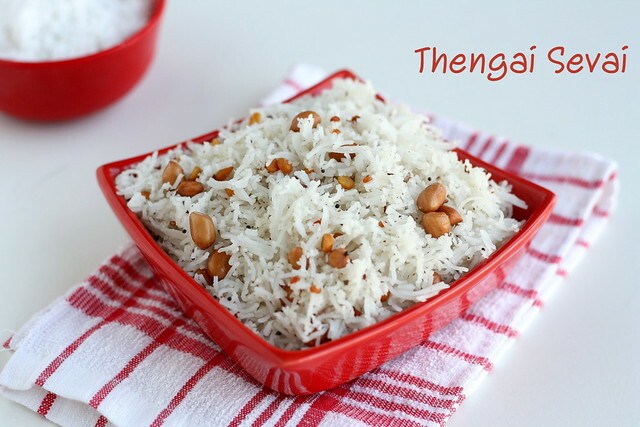 love btoh thengai and lemon sevai!! I love this recipe! Its much different than what my Mum makes.. But this is so easy! Love sevai!! Apart from me none at home love this kind of savoury idiyappams,feel like inviting myself to your place Jeya. i tried iddiyappam...but it didnt come well..thanks for sharing....will try it. very light n healthy food.. Simply awesome and very tempting, beautiful post dear..
Just now made these for dinner.. Simple, light and comforting..
my fav!!!! Love it with simple aloo curry, Must try making them at home now, you have explained it so well!! We make the Sevai which is made with rice soaked nd ground and cooked and again pressed in the sevai maker andd re cooked again...Much more laborious yet healthy as its twice steamed. 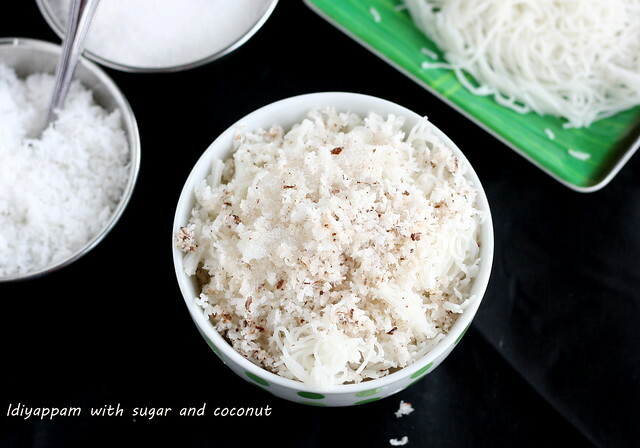 loved the click of the idiyappam and the coconut and the sugar! Looks so tempting...my fav anytime! wow..nice..i tried it..I dint get non-sticky sevai. idiappam was nice but not able to get non-sticky pieces..It appeared like idly upma..i dont know what the mistake is..is that because of my idly plate have holes???? Your recipes are simply great.. The way of presentation, although a complex dish, makes it look simple. I tried out idiappam and it turned out very well.. I have suggested your site to my friends. hai ur all recipes are good to see and i think simple to cook also.about idiappam i tried most of the time its not coming well.i saw ur post.i will try oncemore.thankyou. Thank you so much . will try this time for vinayagar special. Hats off to your cooking skills.. Lovely photos..
Hi Jeyashri, Thanks for the recipe. Btw, I dont have idiyappam flour or kozhakattai flour. Can I make it with normal store-bought rice flour? Will the result be same? You can add store bought rice flour . But it won't be too soft. Else you can make the rice flour at home by soaking it and drying it under shade and making flour. I tried idiyappam but it doesn't separate. It looks like idli. So I couldn't make a proper sevai out of it. Any idea where I went wrong.? Should I add little more oil? Hi jeyashri i tried idiyappam but the flour is too tight to press,what can i do now?? Hi,sprinkle some hot water to this and knead again.If the dough is too tight, you can't press it.